I have to admit, this was kind of a weird issue for me. 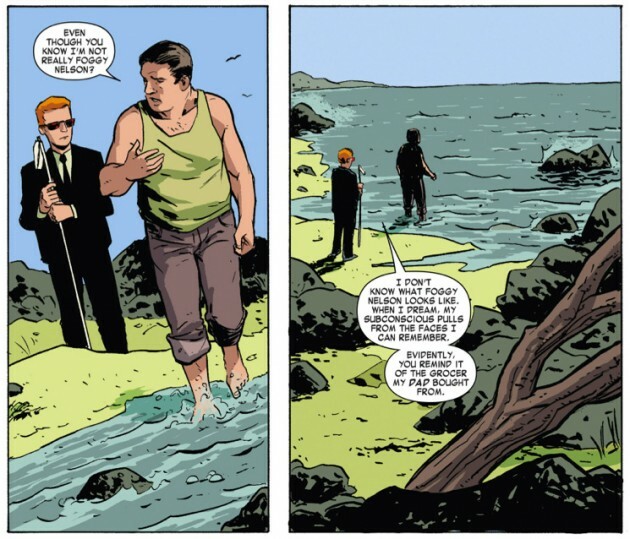 I thought the art was top-notch, the issue itself was as littered with well-written pieces of dialogue as almost every other Daredevil issue I’ve read over the last two years, and there were a couple of scenes that I found very interesting. However, the issue as a whole felt like a bit of a detour, and the “monsters and magic” theme which made for an interesting splash of color last issue, starts to feel a bit forced here. 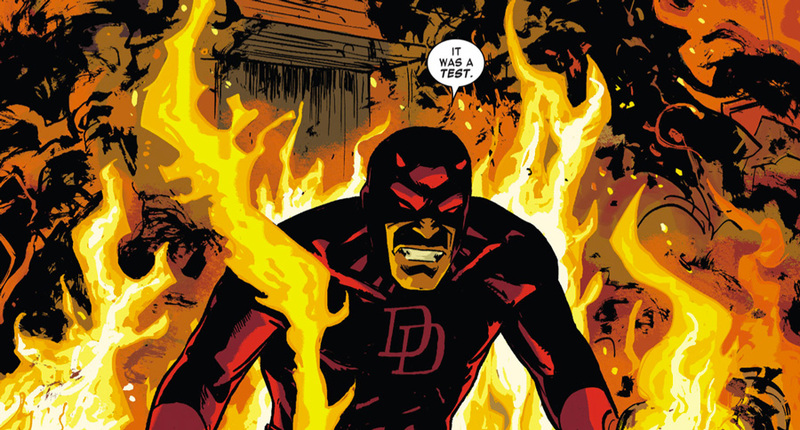 Throughout the issue, Daredevil repeatedly makes comments that are probably meant to reaffirm his status as grounded, “not much for magic,” and clearly out of his element. The problem is that I found that these moments did more to draw attention to the oddness of the story than help smooth out the seams. While still an enjoyable read (and every issue out of volume three really needs to be graded on a separate scale), I would have to rank Daredevil #33 in the bottom five, or even bottom three, of volume three thus far. Having said that, I’m one of those of glass half full kind of people, so let’s start with a list of things I enjoyed! I found Copland’s take on Matt Murdock in the opening scene to be a bit on the frail side – though this might have been intentional for all I know, considering that the scene in question plays out in Matt’s subconscious. In later scenes, however, particularly toward the end of the book, he instead gives us a fairly brutal-looking Daredevil (see the end of this post) that I thought was a perfect match for the challenge the character is faced with this issue and the nearly maddening journey he’s forced to endure. There is a radar splash page of Daredevil in metaphorical(?) hell that is amazingly well done, and I also felt that all each character, despite their unorthodox appearances, was given a perfect set of easy-to-read expressions that worked well for this story, particularly in the case of mostly non-verbal characters. In terms of other things I liked, the whole opening scene was an interesting take on those kinds of dreams you have where something from the outside leaks into your subconscious and starts blending with the dream. In this case, Matt notices his inability to move and experiences this as frustration at being unable to stop “Foggy” from slipping away from him. This also gives us an interesting look at his most private thoughts regarding the ongoing situation with Foggy’s cancer. I enjoyed the element of Matt having an internal visual representation of Foggy that he’d basically borrowed from someone he remembered from his sighted childhood. The scene with the “monsters” that follows is also well paced with fun and engaging dialogue. The second half of the issue is where I start scratching my head a bit, even though it, too, features interesting moments, particularly involving Daredevil’s perceptions. As indicated above, the first half of the issue worked for me in ways that the second half didn’t. In part, I think it may just be a matter of taste. There’s a reason I love Daredevil, but find half the things coming out of Doctor Strange’s mouth to be complete gibberish. Okay, so most of it is supposed to be gibberish, but I find it boring to boot. So, I tend to find myself pulled out of the story when things get too esoteric. To me, the talking snake didn’t add much to the story (or my understanding of it), and felt like a bit of a distraction. I hereby declare it the Jar-Jar Binks of this issue (yeah, I went there). There were two “revelations” in this issue that didn’t quite have the impact on me that I think they were intended to. The first was the link between the “Serpent” – as in Sons of the Serpent – and that other well-known serpent from the book of Genesis. So, I guess they’re devil-worshippers too. Or was. Or something. 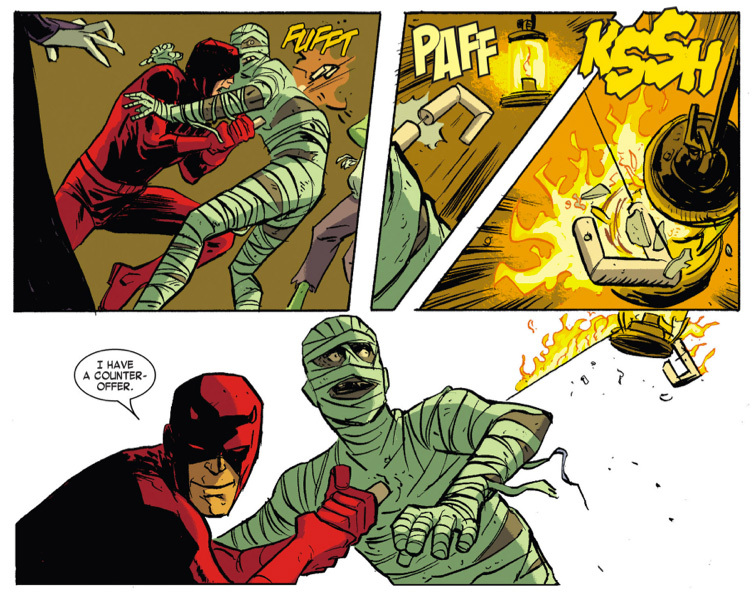 The second revelation was that the Daredevil’s ordeal was designed to only be bearable to people who are sadistic enough (or blind!) to enjoy witnessing the torture of others. It was designed as a test, not torture. Yeah, I guess that’s creepy, but this would have a bigger impact if the story itself would have been more grounded, or the Serpent Wizard more fleshed out. All in all, I’m more than happy to see Matt head back to New York next issue. Despite strong art and memorable individual scenes, and moments, I felt like we were mostly threading water this month. What did you guys think? Just to let you know, I have a new position at work that is currently monopolizing quite a bit of my time and energy. Fortunately, I enjoy it and things should “normalize” pretty soon. However, it has meant that I haven’t been nearly as active on the blog as I had intended to be this month. I’m still planning on doing a podcast episode devoted entirely to the news of Daredevil getting a Netflix series (as I may have mentioned on the Facebook page), so please keep leaving comments on this post, and I’ll try to incorporate your thoughts and opinions! When it comes to Daredevil; Dark Nights #6, I’ll get to it before #7 comes out. After all the buildup to their appearance last issue, the Legion of Monsters was sorely underutilized here. That’s my biggest problem with it, because I like those characters. I suspect sadly that this storyline might’ve been rushed to make way for the cancellation. I enjoyed this issue, partly because, as you mentioned Christine, while the magic/occult elements were in force, Matt resolved the chaos by remaining calm and applying his intellect, both great signs of how this character can operate in such extreme genres. The dream sequence at the beginning was also interesting, in showing Matt’s fears over Foggy’s condition. I also liked how Matt ‘dreamed’ the image of Foggy using the local grocer. You never really consider it most times, but Matt doesn’t know what Foggy actually looks like so I thought that was another interesting view of the world as perceived by Matt that Waid has been so good in demonstrating. I thought that Matt’s dream image of Foggy was very interesting too. My first reaction was that the artist had just drawn him a bit strangely, and then when I read the dialogue I realized what was really going on. It wasn’t something I’d thought about before, but it makes sense that he would imagine how people look based on images he had from when he could see. @ Bee Clayton Matt does know what Foggy looks like he seen him in the Captain universe issue. I’d never heard of the Captain Universe storyline. Thank goodness for trades! I’ll have to look it up. I haven’t made it through all the links on that page yet, but I intend to use it to dig into some of the older posts. (Only started following you a year ago.) My favorite temporarily able to see issue is still the Beyonder, but I think he only interacted with Glorianna in that one. So at that point, Foggy’s looks would still be a mystery. I’m only a year and a half late here, but I think that dream-Matt is so slight because he has the appearance of his younger self before the accident (obviously with blind-Matt accessories). He doesn’t have much experience with his own appearance since being blinded, so it makes sense that his subconscious self-image would resemble the version of himself that he has the most sight-memory of. But yeah, I think that’s a very plausible – and appealing – explanation.